Quilts in the exhibit llustrated the changes in everyday life that occurred when families moved west and established communities in Ohio, Indiana, and other Midwestern states. A somber color palette gave way to brighter colors and more complex pieced patterns. The use of cotton or wool fabrics, border width, and color choice were regionally specific as well and color preferences differed according to settlement and time period. Some quilt designs on view were Diamond in Square and Bars. These large-piece patterns are related to an even earlier form called whole cloth quilts that were not pieced but made from one-color cloth. 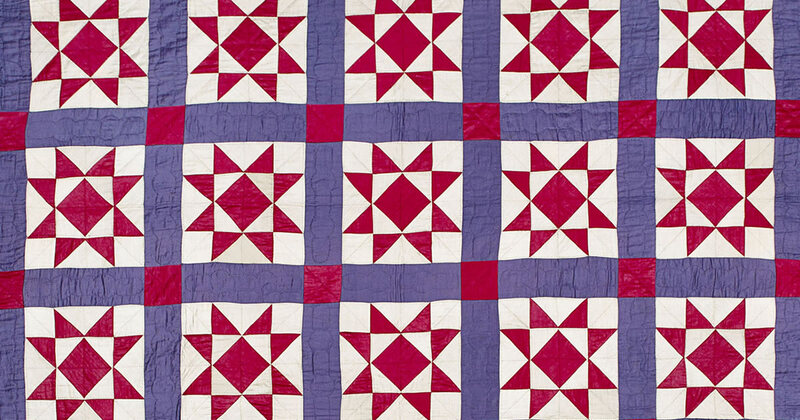 These quilts are the most recognizably Amish with their strong contrasting colors and fine quilting. The Pennsylvania Amish continued creating these patterns long after their brethren left for lands further west. The exhibition included crib and doll quilts. These were made by an expectant mother or grandmother to welcome a new baby into the world. Crib quilts were more frequently made in Ohio, Indiana, and Illinois than in Lancaster County. Visitors of all ages enjoyed making thier own virtual quilt on the in-gallery IPad to save and share with other visitors.